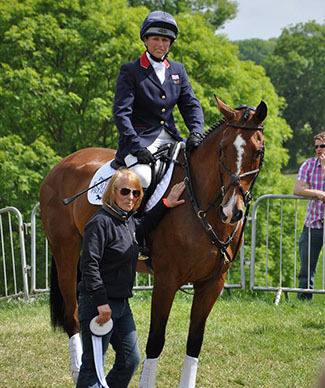 Ruth has been passionate about eventing since she was a school girl, and completed Badminton twice herself in her early 30s. She bred Bella out of Branching Out, a mare she had competed up to Intermediate level. Bella is the first of 6 foals that Ruth has bred from her. Jeanette took on the ride in June 2011. Ruth says: “Jeanette’s yard is local to me so I can be very hands on. I’m also a huge admirer of Jan’s cross country skills, and have been impressed watching her ride a wide variety of different horses at top level. I was confident that she could ride and produce Bella to the best of her ability. “Jan’s past success proves her talent and skill – I did a lot of research before choosing where to send my horse, and know I made the right decision. They jumped an outstanding double clear at Burghley in 2013.